Spicy Coconut and Pumpkin Soup. This indian inspired soup is great served with chapati or other Indian breads. Prepare the pumpkin by peeling it and cutting it into small half inch chunks. Thinly slice the onion and add to the soup pot with about a tablespoon of oil. Fry for a few minutes until the onions are browning. Add the cumin, coriander and chilli to the onion and stir through. Then add the pumpkin and the stock and simmer for 40 minutes. 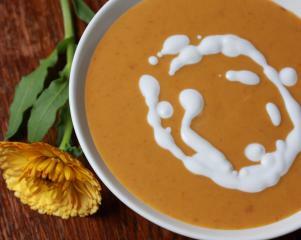 If the pumpkin is completely soft use an emersion blender to blend into a smooth soup. Stir through the coconut cream and serve.